Updated: added reference to T-Mobile price/availability; corrected T-Mo launch date; corrected to reflect that 530 does not have BoomSound stereo speakers. HTC today said several U.S. carriers will soon offer its Desire 530 smartphone. The stand-out feature of the Desire 530 (announced earlier this year) is the unique "micro splash" effect applied to the polycarbonate rear shell. Essentially, small paint dots appear to be sprinkled on the plastic. HTC says no two Desire 530s will have the same pattern. Beyond the appearance, the Desire 530 includes a 5-inch HD screen, Qualcomm Snapdragon processor, and Android 6.0. The main camera has an 8-megapixel BSI sensor and includes tools such as burst shot and panorama. The 5-megapixel front camera includes Auto Selfie and Voice Selfie modes for easier picture taking. T-Mobile says the phone will go on sale July 13 for $160. Verizon has yet to announce its pricing and availability. HTC plans to sell an unlocked version of the Desire 530 online for $179 beginning later this month. HTC’s Desire series has been updated for 2016 with three new models. Smartly, HTC has designed just two bodies based on screen size, but is offering that smaller style with both entry-level and mid-range guts. 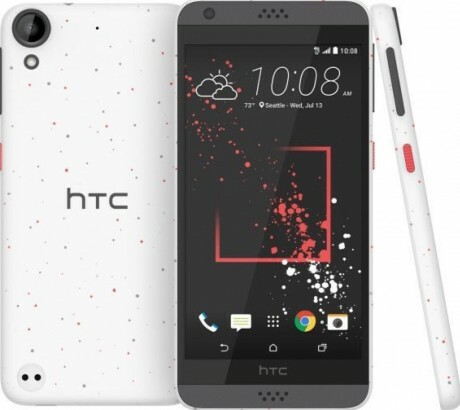 Cricket Wireless recently added the HTC Desire 555 to its lineup of affordable Android smartphones. The 555 is a variant of the Desire 530.